A high VG liquid for the biggest clouds, our 90% VG 10% PG blend delivers dense vapour while maintaining a strong and refreshing taste for the most demanding vapers. A high VG liquid for the biggest clouds, our 90% VG 10% PG blend delivers dense vapour while maintaining a strong and refreshing taste for the most demanding vapers. Sweet green apple paired with a smooth sweet mint provides a mature profile that is sure to satisfy, making this a perfect vape for cloud chasers who need high VG but don't want to compromise flavor. Pairs well with other mints or as an addition to our Appleicious. "Mint and Green Apples come together to give you the freshest flavor ever!" 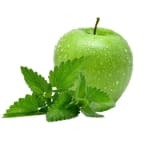 "I am allergic to high quantities of PG and the minty apple was the perfect solution"
Wild combination apple and menthol Good! This wasn't my favourite ejuice from the 180 line. I got a bit of an artificial aftertaste and the apple notes just didn't come through too well. Still, this is a decent juice with big clouds. Doesn't taste much! Very weak. Nice balance between the apple and mint flavours. Neither one overpowers the other. Perfect juice for someone who doesn’t really like fruity flavours in general. Not really sweet or too pronounced. Great first juice that isn’t tobacco. A really delicate and subtle flavour. You get both the apple and mint, but it’s really light. Great if you like light flavours that aren’t too sweet. I don’t know why I never thought to try this flavour before, but it’s great! Love the 180 juices. I got this flavour because I’m sensitive to high levels of PG. Haven’t had any issues vaping it, I’m really happy. BEWARE this juice is THICK. Tastes great, but burns out coils if you don’t have the right kind of gear. picked this up on a whim because hey why not? i didn't think i was going to like it as much as i did. it's got a really interesting flavor and a good balance. the mint doesn't overpower the apple or vice versa. This was first e-juice from your line and i can say it's one of the best e-juice i've had in a long time. The ratio apple/mint is perfect. I can still taste the apple while getting the "cool" effect the mint brings. 5 stars !